for your 4th of July party tables..
just put them all in a decorative basket! Hope you liked my special treat today! We usually pack a picnic dinner and watch the fireworks on the Illinois River at Peoria, IL. My Fav 4th of July Tradition is making as many patrotic desserts as I can, flag cakes, flag yogurt, flag cupcakes! Yummy! My favorite tradition for the 4th of July is the fireworks and a BBQ with friends. I think these are Totally cute !! My favorite 4th of July tradition is spending time with the family bbq'ing carne asada and having a few coronas. Happy 4th to you! Now Julie that is adorable!!! I love them! My fav 4th of July is going to lake on the forth then at night sitting on the dock as they city shoots off the fireworks. My fav 4th of July is going to the lake with family and friends and watching the fireworks on the dock as they are shoot over the lake. My favorite tradition is having our family over for a bbq dinner and then we watch the fireworks. Thanks for sharing your super cute file. going to the parade and fire works! Hubby works 16 hours that day (police office) so it's me and the kids. Thank you! I love this! Thanks for the freebie, our 4th of July tradition is to spend the day out on the boat, we go clamming, fishing, swimming and we picnic on the sand islands and then watch the fireworks. We love to spend the day in the pool, have a BBQ, and the have fireworks and sparklers. This is adorable. Getting together with family would be favorite thing. Thanks for the file. Love having ribs on the 4th of July. My favorite tradition is going to a local church festival on July 3rd and then the same church has a huge 4th of July parade. So a two day celebration. Just great family time and fun! I always loved our family gatherings on the 4th of July. Usually we would enjoy swimming, eating, fireworks, and lots of pictures and story-telling. I think my favorite thing is to watch the fireworks with my kids...thanks for the adorable treat! I love this. Too cute. We bbq at the pool with the family. We like to make hamburgers and watch fireworks. My favorite thing to do is celebrate MY birthday! I am a fireworks baby!!! I love to watch the fireworks on my b-day! Your lollipop holders are adorable and I would love to have the file! Thanks for sharing! Super cute project! We do a barbecue and fireworks sometimes a parade. Cute! We like to BBQ and watch fireworks. Thanks for the freebie! Love the lollipop holder. We usually go to the sonic and get an ice cream or shake and then drive out anf watch the fireworks display. This is a different type of card. Love the color choices you did to make this one pop. We usually have friend over for late supper and watch the fireworks. Hope the weather holds as everyone is having such wet weather. Thaks for sharing your adorable card. OMG these are just too adorable!!!! My favorite 4th of July thing to do is watch the fireworks over the lake at our family's cottage!! Those are absolutely adorable. I'm having a 4th of July party and those would be gone in seconds. Cute, cute, cute. Thanks for the free file. What a super decoration, love to spend as much time with family on the 4th as possible and going to city park with a big blanket (and bug spray) and watch the fireworks as they go off over city park lake. Our 4th of July tradition is spending it with family and friends while BBQ and watching the fireworks. P.S. Love the lollipop file and thanks for sharing it with us. Just too cute....Great Job as always. Happy 4th to all... Have fun & stay safe. I love this. I am always looking for cute sucker holders for different holidays and these are absolutely adorable. Thanks for sharing for free. BBQ's and fireworks are our favorite celebrations. We always go up to our local park where all the festivities are and then at about 10:15 pm when it get real dark, the fireworks begin over our lake. Love your little Uncle Sam treat file. It's adorable! Have a very happy Fourth of July!! These are cutie pies! Thanks so much for the chance to grab 'em.You rocked these lollipops. Fav 4th thing is watermelon and snacks waiting for the dark and the fireworks. You have some awesome projects here. Love them. What we do every year is go to hubby's granny's house and eat her famous bbq then in the evening we go to our local community college enjoy the evening with our kids friends and end it watching some spectacular fireworks. Super cute treat holders!!! We celebrate with a family/friends bbq and watch the fireworks! Our 4th is the Family reunion every year! So that is what we always do. It used to be at DH Uncle's farm until it got to be too much & now it is at one of the (many) cousins! My favorite thing for the 4th of July is making lots of food and having all my family around,,,when it becomes dark,fireworks time ! Very cute little lollipop holder hat ! I love the adorable hats!!!! My favorite July 4th memories were the yearly 4th of July family pick-nicks and clambakes on Long Island each year! My favorite family tradition is going to our towns parade. It's such an Americana experience. 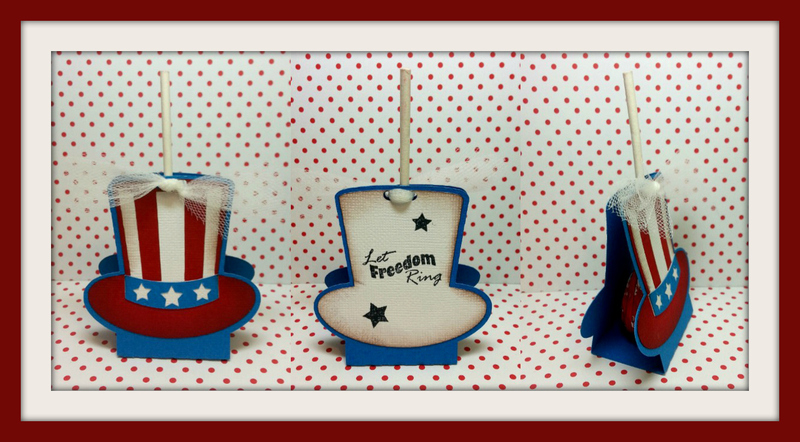 These Uncle Sam lollipop treat holders are so very cute. I can make them for my granddaughters. Our 4th of July tradition is to BBQ outside, but eat inside, maybe take a quick swim, make red, white and blue desserts (cakes, jello) and watch fireworks. It's so HOT in Phoenix, we have to limit our outdoor activities and try to stay cool. Thank you for the free file. I love the 4th of July hat. My family and I usually go to my husband Club House for a picnic. I love see my club family for good food and lots of laughs. Our favorite 4th tradition is a Huge BBQ with friends, a horseshoe tourney and fireworks. Thank you for sharing your file! Nothing like being a day late and a dollar short:)) The favors are very cute. We spent fourth of July at a new park in Royal Palm Beach, Fl. Must have been 50,000 people - just like an extra large family. I love these ones also. You do an amazing job. Fireworks from my dad's boat will always be my favorite tradition!